Copiapoa barquitensis f. cristata hort. = Copiapoa hypogaea var. barquitensis f. cristata hort. Cactus (Paris) xv. No. 66, 19 (1960). Description: Copiapoa barquitensis is a solitary or clumping slowly (occasionally dichotomously branched) by offsets at the base. Root: Tuberous-napiform, connected though a narrow region to the main stem. Stem: Grey-brown or more commonly bronzed, depressed-globose, 3-4 cm in diameter (up to 7 cm in cultivation), the aerial part is almost disc-shaped and almost sunken in the ground with white wool in the centre, also in the older areoles. Epidermis smooth. Ribs: 10-14(16) divided in extremely low often spiralled tubercles up to 4-8 mm apart, about 4-7 mm in diameter and up to 5 mm tall. Areoles: Small 1-3 mm wide, sunken, oval, with white felt and well separated. 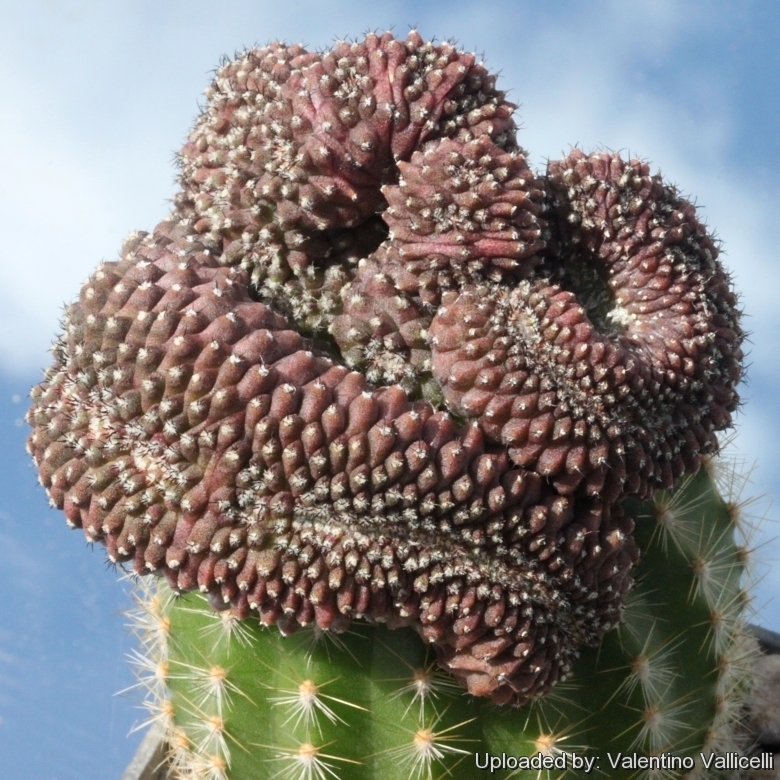 Spines: Completely absent on older part of the plant. Central spines: Absent or solitary and minute. Radial spines: Very few (from 0 to 10) thin, short and less than 4 mm long. Brownish or black becoming ash grey and later deciduous. Flowers: Diurnal, apical, with the typical Copiapoa scented, yellow and pink broad 1,5-2 cm long and 30-40 mm wide. Blooming season: Hotter days in summer, blooms open about to hours after sunrise and close two hours before sunset. Fruits: Slightly fleshy, small globular whitish with only few minuscule apical scales. Seeds: Shining black an smooth, about 1 mm long, 0,75 mm large and 0,5 mm thick. Cultivation and Propagation: It is a summer-growing species fairly easy and robust to cultivate, but very slow growing. This plant is xerophytic, adapted to dry soils and is quite susceptible to over-watering if kept in a non ventilated place especially after the first flowering. Hardiness: Keep warm and dry in winter to avoid rot. It needs mild heat in winter, avoid any frost. Propagation: Stems planted as cuttings. Grafting is often used to speed growth rate and to create a back-up to plants in collection.